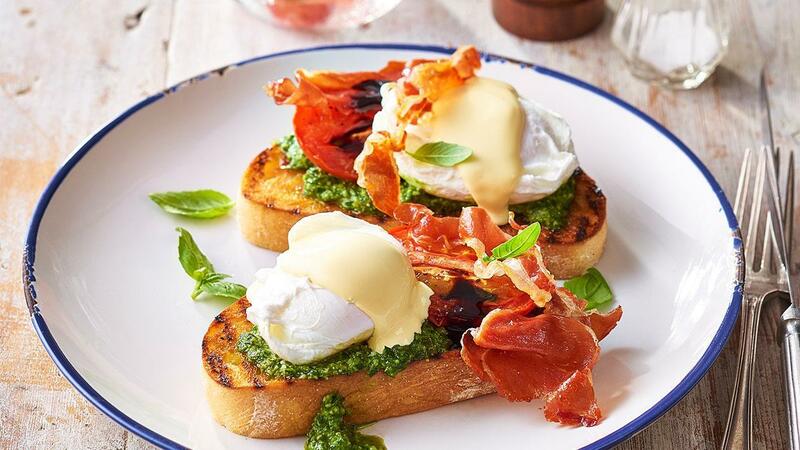 Poached eggs on fresh pesto. Char grill or toast ciabatta. Roast tomatoes in oven for 20 minutes or until softened a little. Blend basil, pine nuts, garlic and cheese in a food processor until combined, slowly add oil with motor running, season. Place ciabatta on plate, top with pesto, eggs, prosciutto, roasted tomatoes, KNORR Garde d’Or Hollandaise sauce and KNORR Italian Glaze.